This elegant lantern was adapted from a silhouette in a book of Chinese paper cuts. A variety of techniques are used to embellish the lantern including blackwork, pulled thread, laidwork, and or nué. The background area is executed in a beaded open pattern of diamond outlines and the mat itself has an intricate blackwork pattern with gold accents. 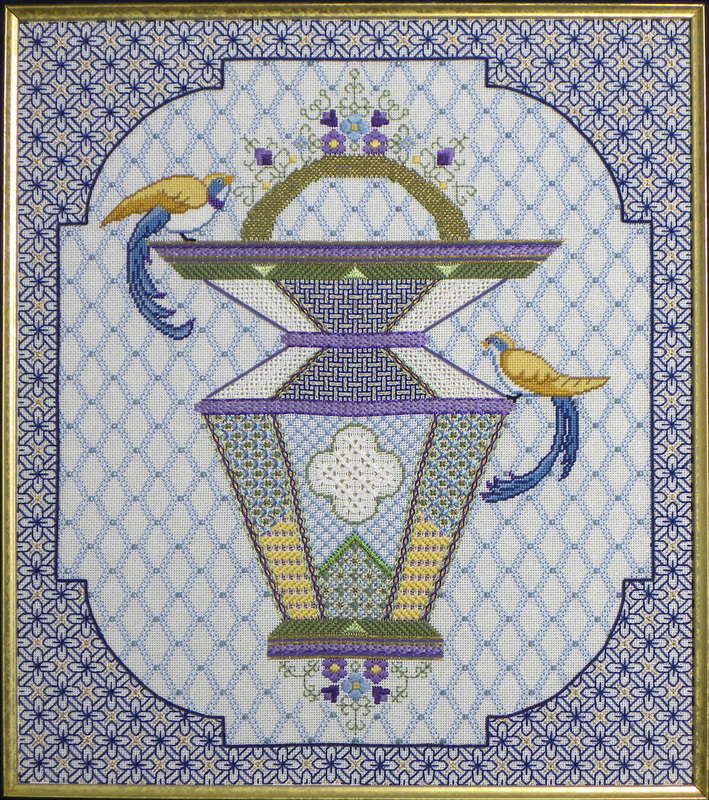 The pair of regal birds and the floral accents in the fretwork add a naturalistic touch to the design.The lantern and mat outlines are counted to insure perfect symmetry, and a poked hole pattern is used to establish these contours. The same blues, greens and golds may be used with all color choices, but stitchers have used either peach-russet, pink-rose or lavender-purple accents.